Adobe has released Photoshop Elements 11, a new version of its consumer-level photo organizer and editor. In an effort to deliver the power of professional products in a friendly way, Adobe made big changes to the interface. Targeted to hobbyists and enthusiasts—not those who edit photos daily in their jobs—this release focuses on improved usability and performance. Version 11 also includes new guided edits, and enhancements straight from Photoshop CS6 that makes it possible to select hair and fur. Returning to the light-gray interface of older versions, the Organizer sports a toolbar of large buttons at the bottom that let you fine-tune the organization of your photo collection with additional information. A handy Folder view sits on the left, enabling you to navigate your photos based on the folder structure of your hard drive. It’s not new, but enhanced to be faster and easier to find. At the top of the window, you’ll spot four new tabs that change your view. Media displays everything you’ve imported using the Organizer. People taps into facial recognition technology and people tags to create stacks of photos; point your mouse to a stack to see miniatures of the photos inside (you can choose to see whole photos or faces only, just like iPhoto) or double-click a stack to open it. While you’re in the main People view (not inside a stack), you can create groups of people for quick viewing of friends and family. Using the new Places feature, you can view photos based on location, as well as add location information manually. The new Places view lets you see photos based on location. GPS-enabled cameras and smartphones, like the iPhone, assign this data automatically, though you can also add it yourself for cameras that do not have this capability. Select the photos and click the Add Places button at the bottom of the Organizer and a large map appears. Enter a location into the search field or drag and drop photos onto the map; a red pin appears marking that location. Clicking Done returns you to the main Places view wherein you can double-click a pin on the map and see the photos that were taken there as thumbnails on the left side of the map. Check the Show Only Media Visible On Map checkbox beneath the map and then use the map's zoom slider to focus on a location. The photos on the left then change according to which pins are visible on the map. 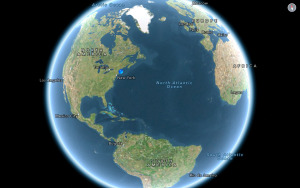 Clicking a photo triggers the map to reposition itself and zoom into the location of that pin. Events view is also new and lets you sort photos by events you create manually or those the Organizer makes based on capture date and time (called Smart Events). Use the filtering options on right side of the window to restrict the Events view using a handy calendar. Unlike iPhoto, you can’t create events when you import photos. The newly redesigned Organizer gives you easier access to the folder structure on your hard drive. The Elements Editor is also awash in light-gray paint (again) and sports larger, full-color icons. The Edit modes were reorganized into large tabs at the top and include Quick, Guided, and Expert. In Quick mode, thumbnail previews in each correction panel appear automatically when you open the panel. In Expert mode, the Tools panel includes categories that identify which tools are used for what (selecting, enhancing, for example). A larger Options bar now lives at the bottom of the interface where it’s easier to see and as a result, use. You can open and close frequently used panels such as Layers or Effects by clicking buttons at the bottom of the interface. Lastly, the row of buttons that used to live beneath the Layers panel have been moved to the top. Guided mode includes a slew of built-in tutorials that let you achieve an effect easily and non-destructively. In Elements 11, you’ll find four new ones including High Key, which adds a white-washed effect to your photo (typically done at capture). Choose between a color or a black-and-white high key effect and finetune it using a slider that triggers the Diffuse Glow filter. Low Key does the opposite and lets you use a Background Brush to turn a light background dark (useful in nature-based macro photography). The new Vignette Effect adds a soft edge-vignette to draw the viewer’s eye into your subject (great if you’ve got a slightly overexposed or busy background). Choose a white or black vignette and use the Intensity slider to adjust its strength, and the Refine Shape button to change the shape of the vignette. The Tilt-Shift effect creates two bands of focus across your image, one soft (blurry) and one sharp, to mimic the effect of shooting with a tilt-shift lens. Once you’ve finished a tutorial in Guided mode (which feels quite zippy), you can pop into Expert mode to see how Elements created it and/or fine-tune it manually—a great way to learn. Among the new guided edits is the Vignette Effect, which you can use to add a soft black or white edge vignette to your photos. Speaking of Expert mode, the Refine Edge dialog—useful for modifying selections—now includes a Smart Radius option, a Refine Radius tool, and new output options, all derived from Photoshop CS6. You’ll also find three new filters in the Sketch category, including Pen and Ink, Graphic Novel, and Comic, all of which accentuate areas of high contrast to produce unique hand-drawn or cartoonish effects. Selecting soft areas, such as hair and fur, is easier in Elements 11, thanks to the enhancements in the Refine Edge dialog, which were taken straight from Photoshop CS6. Photoshop Elements is a great program for users who’ve progressed beyond iPhoto, and version 11 is the friendliest yet, though the redesign will take veterans time to get used to. The larger icons in both the Organizer and the Editor are much easier on your eyes, and the lighter interface makes the program feel more accessible and less overwhelming. Even though your photos look better on a dark interface, Adobe seems to be reserving that for their professional products, such as Photoshop CS6, InDesign CS6, and Photoshop Lightroom. If you use your hard drive's folder hierarchy to organize your collection, you'll have an easier time locating and thus working with the Organizer. Both the Organizer and the Editor in version 11 zip right along. The new guided edits are timely and practical, and the Refine Edge dialog enhancements are great for creating tough selections. If you’ve got the money and value your eyesight, Adobe Photoshop Elements 11 is a great upgrade.